Put your name on display! Our unique name and monogram earrings will give you a personalized touch to your look and jewelry. Many pieces can be made to reflect any name within the particular items character count. 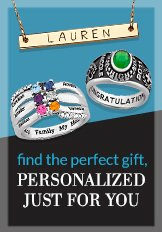 Add a name earring to your jewelry collection or give someone you know a personalized pair! Your outfit reflects your personality and style. Make a good impression by wearing a pair of personalized monogram earrings that complement your ensemble. We have a collection of exquisite ear jewelry designed to make you look more gorgeous. Check out our selection of custom crafted earrings below and place your order today.